Pashmina fibre was originally designed to keep baby cashmere goats warm in the Himalayas. The Changthangi or Pashmina goat is a breed of goat from Tibet or neighbouring areas in the Ladakhi Changthang, usually raised for meat or cashmere wool – known as pashmina once woven. These goats grow a thick, warm fleece. They survive on grass in Ladakh, where temperatures plunge to as low as −20 °C . These goats provide the wool for Kashmir’s famous Pashmina shawls. Note: the word ‘pashmina’ has been purloined by some manufacturers to describe any long scarf or shawl in any fibre including synthetics. This can be very confusing to buyers. 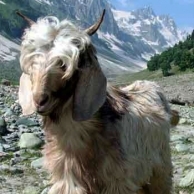 True pashmina is the fibre from the young Changthangi or Pashmina goat. Wash your precious pashmina product the same way you would your own hair: a gentle handwash in warm water and shampoo. To dry, squeeze dry inside a towel and dry flat in shade. This entry was posted in KASU stock, News and tagged baby cashmere goats, Changthangi, goat, Himalayas, India, Kashmir, luxurious, Pashmina goat, Pashmina shawls, Weaving on February 2, 2014 by Beverley Bloxham.